Chamonix or Samoens for your ski property - you decide! If you're thinking of buying a ski property this year, and can't choose between Chamonix and Samoens, we're here to help. They're both great resorts with a lot to be said for them. But, it's different strokes for different folks, so we want to give you the lowdown to make sure you pick the one that's perfect for you. In a nutshell, if you want the facilities, nightlife and more cosmopolitan atmosphere of a big resort, you're probably looking at Chamonix. Widely known and well established, it's got pretty much everything. But then, should you prefer a quieter atmosphere and a traditional French feel, coupled with lower property prices, Samoens may just be your idea of Alpine heaven. The choice is yours. To start you off and whet your appetite, just have a look at two hot properties currently on the market, one in each resort, before continuing with our "Head to Head" guide which looks at several aspects that you'll need to consider. If you're looking for something special, Gareth Jefferies of Alpine Property suggests you take a look at this high end property in an historic building in Chamonix. 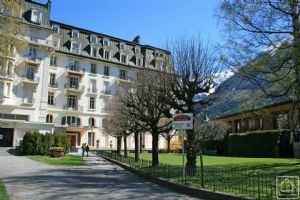 Formerly part of the Chamonix Palace, this three bedroom ground floor apartment is on the market at 1,050,000 Euros. The property has been renovated throughout, has patio doors leading to a large terrace, with views of Mont Blanc: A stylish apartment in an historic Chamonix property. If the budget doesn't stretch that far but you're still seeking a truly delightful place, what about this chalet in Samoens, on the market at 725,000 Euros? Situated on the south-facing slopes above the village of Samoens, it includes a two bedroom apartment with its own entrance. There is a large and largely flat south-facing garden, with delightful views across the Valley du Giffre. What could be better? Perfectly situated large chalet with a fabulous view. Maybe the first thing to look at is price. Not many of us are lucky enough to be able to disregard the cost when it comes to buying property. It will probably come as little surprise that you will get more for your money in Samoens than in Chamonix. For a place to call home in Chamonix, you'll have to dig a little deeper into your pocket. Prices are pretty top end in Chamonix. As both our expert agents, Rhiannon Cook (of France Property Angels) and Gareth Jefferies (of Alpine Property), agree. But then there are so many benefits that go along with the higher prices. Not quite so bank busting (though still not cheap) is Samoens. In this smaller, yet still excellent resort, property is generally mid-range, with more chance of obtaining a larger property for a little less of your hard earned cash. "The prices may be higher in Chamonix, but what it does have is Mont Blanc and that will never change. This simple fact means that the town will always be on the map, always visited, there will always be people looking for rentals, and always landlords making good investments. There is a supply and demand issue due to lack of land left to build on, also resulting in increased property prices - something that will also never change due to the nature of the valley." "When it comes to investment and rental potential, you can't beat Chamonix. With the longest rental season in the Alps, the resort has a true year round appeal." "In Samoens rentals are cheaper, but the resort is still popular and offers good returns on your investment. The winter and summer seasons both offer opportunities for rental business, but can be constrained by the fact that the ski lift season is a little shorter than in Chamonix." Huge potential on offer here, with this renovation project, within walking distance of the centre of Chamonix and ski bus stops. 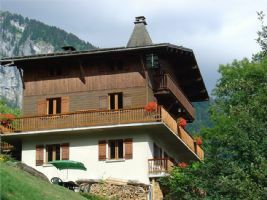 It's on the market at 890,000 Euros: Chamonix - Chalet to renovate. This welcoming ground level apartment sleeps 6-8 and benefits from a ski locker and outdoor parking. A car isn't essential due to its close proximity to the ski lift and village - a definite advantage if renting out. What's more it offers great dual season appeal with riverside walking and biking nearby plus convenient use of the residents' summer pool. Conveniently located 2 bedroom apartment with use of outdoor pool and gym facilities. You can't disregard accessibility as a factor when comparing one ski resort to another. After all, you (or your renters) will have to travel to it from your home, wherever that may be! Chamonix just wins out on this one, with great motorway and rail connections. However, Samoens is almost as good, being just over an hour by road from Geneva. "Chamonix, poor connections, bad for multi ability groups. Not good for families. Great for groups of men who need to beat their chests. Excellent but over popular off piste and world class for guided ski mountaineering." "Chamonix can be challenging to get around. However, once you reach the slopes, it quickly becomes obvious why the queues are there. The skiing is world class, the terrain and elevation unbeatable. If you are prepared to venture off piste, you can live here for a life time and never get bored. I have only just scratched the surface in the ten years that I have been here, and I ski regularly. Whilst understandably not ideal for young families and beginners, there are baby slopes that are just fine to learn on, and you then have a never ending learning curve that will keep you entertained for ever." Both agents agree that both resorts offer fabulous skiing, it all depends on what you want. Elite skiers and fans of off piste challenges just have to head for Chamonix. No question. But if you're not an expert, or can't be bothered with the queues and just want to get to the pistes easily and ski all day long, you might be better off in Samoens. If you've got youngsters in tow, you might find Samoens just has the edge on being family friendly. The sheer size of Chamonix, plus the time consuming travel about the resort can be a little daunting. It's generally noisier, busier and more expensive in Chamonix. Samoens, on the other hand, is much quieter and simple to get around. There's more of a family feel to it. And, the French who live there are very accepting of children in the restaurants and bars. If you are hoping for the real deal on après ski, you can't go past Chamonix. There's something for everyone here, and the option to party 'til dawn is always there. The resort has a huge selection of bars and restaurants with every type of cuisine you can name on offer. It's also very multi-national and multi-cultural in every way. English is widely spoken, and you'll be rubbing shoulders in the bars with folks from all the corners of the globe. Samoens is a whole different ball game after dark. Far calmer, nightlife is more likely to be a case of enjoying a drink beside a blazing log fire in a friendly little bar or enjoying a delicious traditional Savoyard meal before returning home to sleep. If your party includes young adults and older teens you're probably going to be better off in Chamonix. Taking into account the sheer scale of the place and its nightlife, Chamonix has to be awarded the highest score on this one. But if you prefer the simple pleasures of life in the Alps, Samoens comes out the winner. Unsurprisingly, the big resort of Chamonix wins again in this category. Chamonix has seemingly endless activities to try, whatever the season. From helicopter rides to luxuriant days in a spa or hamman, here's something to keep everybody happy here on non skiing days. Pretty much any mountain sport you can think of is available in Chamonix, so whether your tastes run to the exhilarating (for example, rock climbing or luge) or the gentler pleasures of snowshoeing or a husky sledding ride, you'll never be stuck for something to do. The fabulous swimming pool also sets Chamonix apart - swimming is a wonderful way to unknot those tired muscles after a heavy day's skiing! Samoens too, has activities you can enjoy if you're not heading for the pistes. It's just that there's less choice. You're more likely to find yourself browsing the stalls of a traditional village market or sipping a "chocolat chaud" in a cosy café then ice climbing. But there are opportunities to try dog sledding or even igloo building! Samoens doesn't have a swimming pool, but it has a super open air ice rink, which is very much in the spirit of an Alpine holiday. Let's face facts here. You just don't go to Chamonix for peace and quiet. You go for the exciting, challenging skiing, the buzz of the après ski, and the cosmopolitan atmosphere of the town and the people who choose it. Chamonix, bursting with visitors of all nationalities, is never going to score highly on peace and quiet! Samoens can, at last, truly claim a significant victory in this category. Far more peaceful than its larger sister, you can immerse yourself in the beauty of the surroundings and relax in this little town. Air pollution is almost non-existent too, meaning you can fill your lungs with that legendary crisp mountain air. Blissful. Once more, the winner's ribbon goes to Samoens. Chamonix is far more highly developed for tourism, and according to Alpine Property's spokesman Gareth, it's lost its heritage and charm in the course of gaining its modern, vibrant feel. For Rhiannon Cook, however, the trade-off is worthwhile, as she adores the buzz of life in Chamonix. Chamonix has stunning views of mountain scenery, as indeed does Samoens. But if you're looking for traditional French charm, it just has to be Samoens. The smaller resort has retained its original features and an authentically Savoyard atmosphere. The language of the day is almost always French, so if you're heading for Samoens you might need to brush up on your language skills. But then, that's all part of the fun. Round 10. Full-time living or holiday home? Which is more suitable to be a full-time home? Our experts disagree on this question! Rhiannon has lived in Chamonix for many years, and says she wouldn't want to be based anywhere else. Life in Samoens, she says, is beautiful but too quiet. She enjoys the vibrancy of Chamonix, and its never ending ability to change and answer the demands of a modern day population. Gareth has different ideas though, saying that although Chamonix has all the facilities required for a permanent place of residence, it's too busy, and being at higher altitude, too cold in the winter! He prefers Samoens with its less extreme snowfall and community attitude to life. The cost of living is lower in Samoens too, which has to be considered if you're thinking of settling down there. By the smallest of margins, Samoens has come out on top! Though looking at the scores, both resorts won an equal number of categories (4 each), with both resorts having a lot in their favour. So it must be a case of which suits your personal requirements and tastes best. If you want a busy resort with lots going on when both skiing and not skiing, Chamonix would seem to be favourite. But for those of you after some peace and quiet and wanting a more traditional Alpine experience, Samoens might be the place for you. You must take your pick! NB: With thanks to Gareth Jefferies of Alpine Property (see all their properties) and Rhiannon Cook of France Property Angels (see all their properties) for their insider knowledge.